One of the most popular gemstones throughout history, the ruby is durable and dense – the only natural gemstone harder is the diamond. 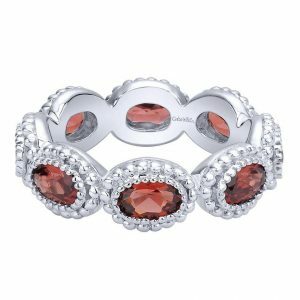 This beautiful red gem is the July birthstone and makes a great gift that can be worn regularly. Many ancient cultures were fascinated with rubies, believing they held power over life. Called ratnaraj in ancient Sanskrit, ruby meant “king of precious stones.” In the hopes of being reborn as an emperor, ancient Hindus offered rubies to the god Krishna. Rubies were also divided into four tiers, with the best rubies thought to provide complete safety. When first found in Burma around 600 A.D., rubies were used by warriors for invincibility in battle. Mogok, Burma is an area famous for their dark, high quality stones and a 100 carat ruby was found there during the late 1800s. Royals in Europe also cherished this popular gemstone, believing that it provided good health, wisdom, wealth and success in love. The Rosser Reeves Star Ruby, one of the most unique and famous of these stones, is displayed at the Smithsonian Institution in Washington D.C. This gem is 138.7 carats and has a six rayed star expanding from its center. Whether you are looking for ruby jewelry for a loved one with a July birthday or are interested in having your ruby jewelry appraised, visit Diamonds Forever at 3689 Midway Drive, Suite A in San Diego, California.